And now, for the man toddler of the hour. Here he is, the handsome little birthday boy in all of his first birthday party glory. I think it goes without saying that he loved every second of his Carnival Party! 1. Carter's Carnival John-John was custom made for him by the same eBay seller who made his baptism John-John seen here. Again, I cannot sing her praises enough. Thirteen-stitches was just absolutely fantastic to work with and she truly pulled off the perfect vision I'd had in mind for C's Birthday John-John! 2. 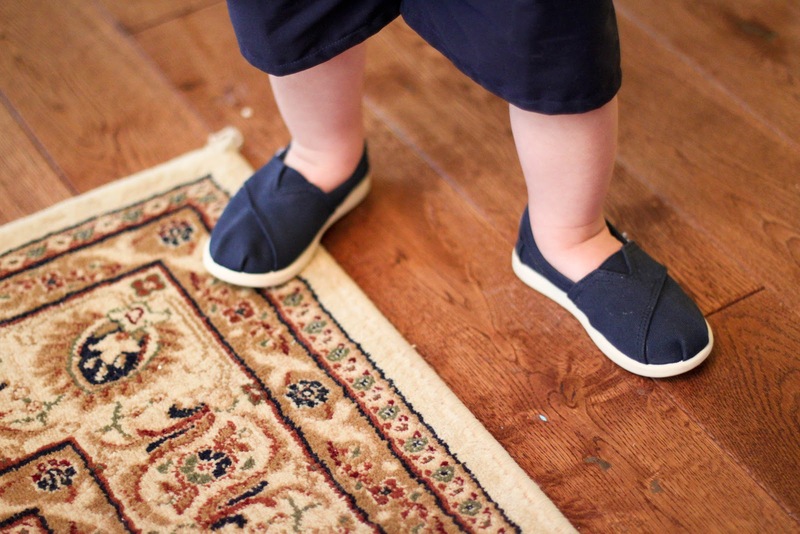 C's tiny TOMS. thank you, nordstrom. is there anything cuter? 3. i just love him so much it hurts. that's all there is to say! just look at those baby blues! 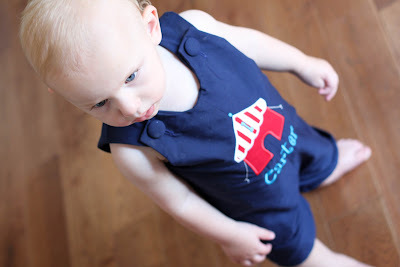 4. post cake-smashing, C changed into his My First Birthday onesie, the perfect Kohl's steal for the occasion! Tomorrow I'll be posting some of my absolute favorite pictures from the day, C's Cake Smashing pictures! I may be biased, but you won't want to miss them! Chances are that by the time you're reading this, I'll be on the beach with a slushy drink in hand. Needless to say, you won't want to miss the hilarity and snark that's bound to ensue while on vacation with The Husband's family. I tweet a lot, so you should probably follow. Not to mention, you can catch up with our latest antics on the ILYMTC Facebook Page! OMG he's so cute, I die. And I love your snarky tweets when with your in laws, they crack me up. He looks so rad! What a big guy. He's a doll. Enjoy your drink(s)! HE IS SO CUTE! Looks like he is FULL of personality! Wonder where he gets that from?!?!?!!? LOVING SO MUCH IT HURTS....I didn't know that came along with being a mamma but I'm right there with you sister! SO CUTE!!!! That first picture is so adorable and shows just how excited he was!! Ah we had the separate outfit for the cake as well! Looks like he was loving every minute of it! He is so stinking cute! 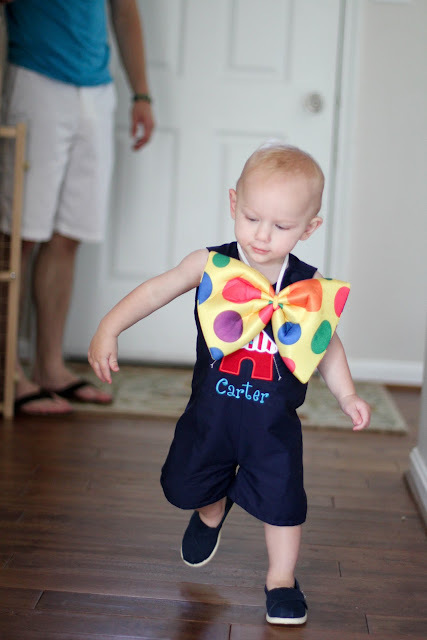 Love the big bow tie and of course the shortall! I told Michael that I'm buying Ethan Navy Toms the moment Ethan takes his first steps. They are sooooooo cute on little ones! Everything looks wonderful! Your attention to detail really paid off. 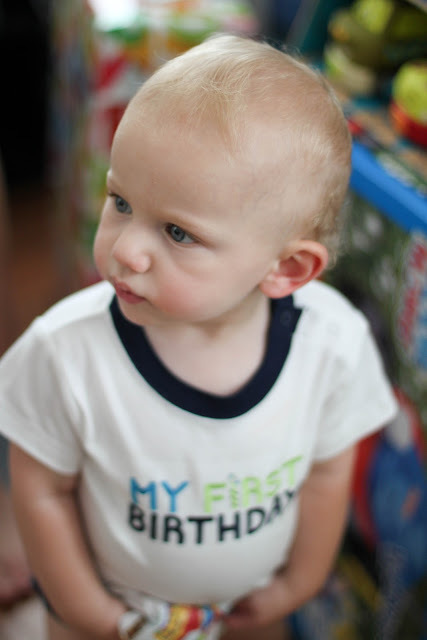 Your little guys looks like he truly enjoyed every minute of his birthday party! will C share his Toms with me? too effing cute! Love his birthday jon jon so much!! Have fun at the beach! It looks like he had a BLAST!!! So cute and love the bday outfits. 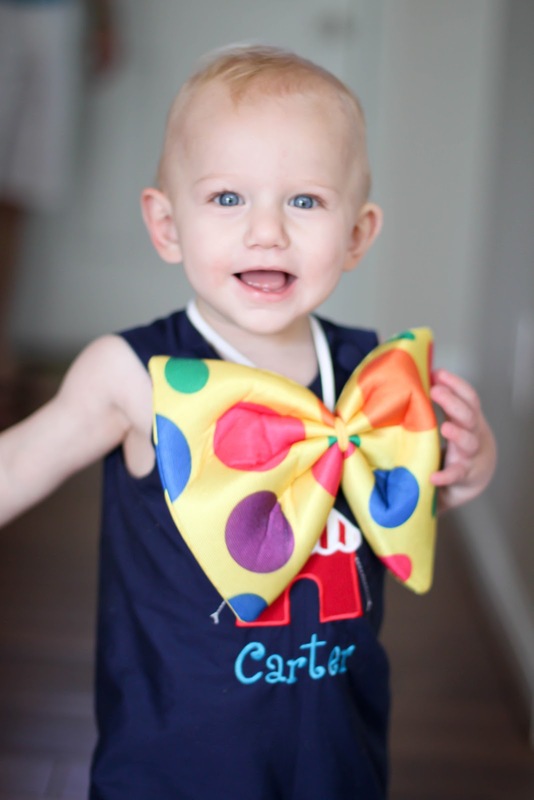 LOVE the bow Carter is wearing! So cute! Loving your updates...been MIA due to my crazy work sked so just catching up on all your posts...can't wait to see the cake pics! I love the onesies. He is absolutely adorable! ohh my gaash you are killing me with the tiny toms! so freaking cute, i have a pair of sparkly silver one for blake when she gets bigger. i die. so cute. I love that John John! I am going to have to remember that. What an adorable outfit! 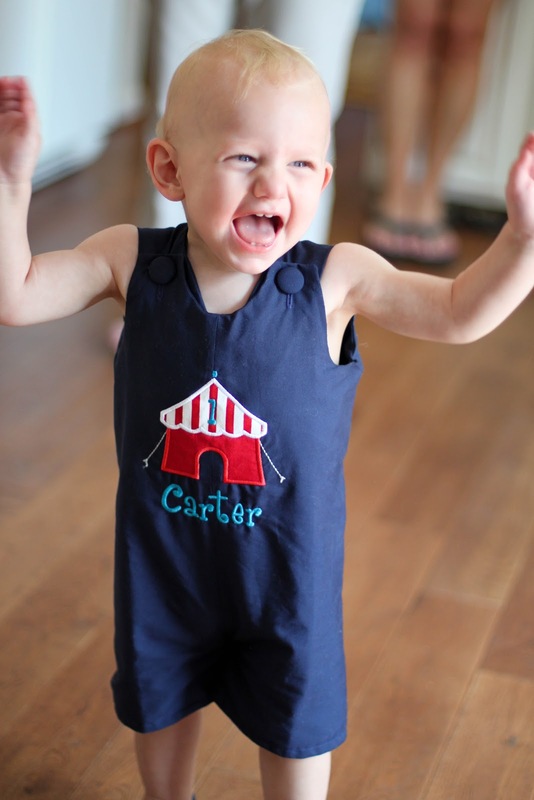 You somehow manage to find so many cute clothes for Carter! Can't wait to read more about the party! that jon jon is PERFECTION! she could not have done a better job! I love his outfit! Just found out my sis is having a boy. I will definitely be checking out this seller!